The Eucomis certainly makes for an attractive conversation piece! 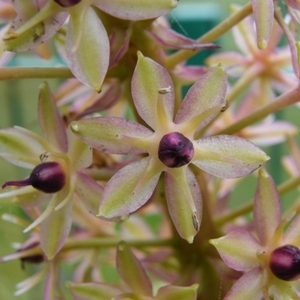 Commonly known as the pineapple lily, because of its ruff of leaves held above a tall column of striking purple edged flowers, it is actually a member of the asparagus family. Forming showy rosettes, the large wavy margined leaves are so lush and exotic, it is worth including in any tropical scheme. If you leave the flowers you’ll appreciate the purple berry like fruits that make for a beautiful show in their own right. As a large South African bulb it was thought of as a greenhouse rarity, too tender for the average gardener, but -18oC didn’t phase it this winter on Cameron Path! Grow it in a well-drained site, in full sun and mulch to give it some protection in harsh winters. Relatively easy to grow if allowed its winter dormancy by being grown outside.